Everything you need to know about the Stats page. The Stats page is where you can find a snapshot of your parents' engagement level and how it is changing over time. No more guesswork! If you need to take action, you can send an email to parents right from the Stats page. The Family column shows the list of students’ names in bold, with their parents and caregivers shown below. The last time the parent logged into the site is shown under the parents' name. 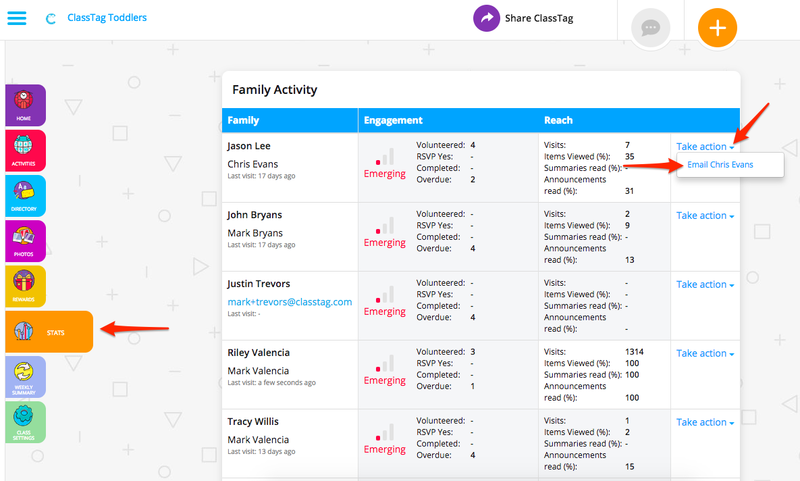 The Engagement column shows each family’s status with "Emerging", "Strong" or "Thriving" based on their status of engagement and usage of ClassTag and communications in the email. The objective is to get more of your families to "Thriving" status as you continue to use ClassTag. This also provides a snapshot of how engaged the parents are in this class. This is a visual cue that reflects the statistics in this column showing how many times these parents have volunteered, responded to RSVPs, completed requested items, and how many times required items have gone overdue. The Reach column is where you'll see the statistics for how this family is reading the information from the school. You see how many of your announcements have been read, and how many of the weekly summaries and activities have been opened in their email or viewed on ClassTag. If you find that you need to prompt a family for greater engagement, click on the Take Action drop down and select which family member you would like to send an email to.